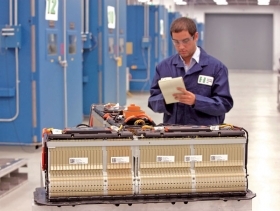 A General Motors engineer checks out a Volt battery pack. GM says the liquid cooling system boosts battery performance and makes an eight-year warranty possible. DETROIT -- The long warranty -- eight years or 100,000 miles -- on the Chevrolet Volt battery got the headline last week. But the battery's liquid heating and cooling system helped make it possible. Batteries last longer and perform better when they avoid extremes of hot and cold. And because liquid cooling systems are more compact than air-cooled systems, General Motors Co. engineers had room for more battery cells. The Volt hybrid, which goes on sale late this year, can drive 40 miles on the battery. Then a gasoline engine kicks in to generate electricity for the motor. Standard auto coolant circulates through 144 metal plates, called fins, between each of the Volt battery's 288 cells. The fins are only 1 mm thick, but coolant still circulates through channels in them. When the battery needs to warm up, a heating coil warms the fluid. Sixteen heat sensors help regulate the temperature of the cells throughout the battery, helping battery life, Bill Wallace, GM's director of global battery systems, said at a press event to announce the warranty last week. The warranty presumably will give buyers of the plug-in more confidence in the Volt's new technology. GM says the battery is designed to perform reliably between minus 13 degrees and 122 degrees. Batteries in electric cars from startup Tesla Motors Inc. are also liquid-cooled. The Nissan Leaf's batteries are air-cooled. GM engineers designed the heating and cooling system for the Volt battery pack. The cells are supplied by LG Chem Ltd., of South Korea.